The Jungheinrich AM 22 hand pallet truck with quick lift and 1,150 mm fork length is a premium transport aid that will boost your productivity. 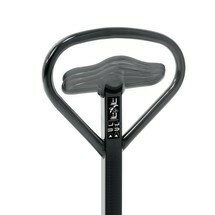 Thanks to the quick lift function (up to 120 kg), you can increase your throughput while minimising the required effort. 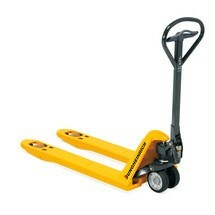 The Jungheinrich AM 22 hand pallet truck with quick lift and short forks is a premium product for transporting such items as Euro, display, half and quarter pallets. It is characterised by its enhanced efficiency and manoeuvrability. Thanks to the quick lift function, you can increase your throughput while minimising the required effort. The Jungheinrich AM 22 hand pallet truck with short forks is a robust and reliable premium product for daily pallet handling in confined spaces. 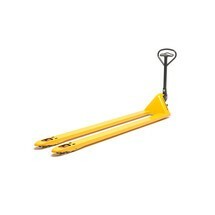 Be it on lorries or in narrow aisles – the pallet truck with short forks is always there to help when things get tight. The hand pallet truck for long goods is a premium product delivering proven Jungheinrich quality for continuous, regular use in your operation. 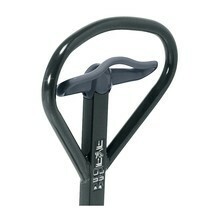 Quiet operation and maintenance-free construction make it an ideal transport aid for custom-length goods. The Jungheinrich AM 30 hand pallet truck with quick lift is a reliable aid for transporting goods weighing up to 3000 kg. The robust construction is maintenance free thanks to the high-quality pump hydraulics and lifetime lubrication of all joints. The low-noise Jungheinrich AM 22 hand pallet truck with quick lift is extremely quiet, thus allowing you to use it for transport and deliveries in quiet zones. It offers capacity for loads weighing up to 2,200 kg, which are transported in virtual silence thanks to low-noise wheels and noise-absorbent mats. Thanks to the quick lift function, you can increase your throughput while minimising the required effort. 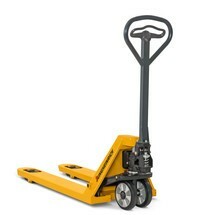 The Jungheinrich AM 20 hand pallet truck with 2000 kg capacity offers tried-and-tested Jungheinrich quality. The robust and reliable premium product is ideal for continuous daily use thanks to its easy handling, maintenance-free construction and outstanding durability. The Jungheinrich AM 22 hand pallet truck with quick lift and long forks is a premium product for continuous daily use and particularly well suited for transporting long goods or multiple pallets simultaneously. Thanks to the quick lift function, you can increase your throughput while minimising the required effort.